If your car's engine is sluggish or full of popping and hissing noises, are there ways of diagnosing car engine problems on your own? Yes, and it's even possible to diagnose car problems online! What Does the Engine Do? Every car's engine converts fuel (gasoline or diesel) so the vehicle can run. This is done though an internal combustion system. Internal combustion systems contain many parts along with the engine parts that are connected to the internal combustion system itself. There are two general types of engines, diesel engines and gas turbine engines. Spark Plugs - The job of the spark plug is to ignite the air/fuel mixture so that the internal combustion system starts. Valves - Intake and exhaust valves are an important part of your engine. The intake valve allows air and fuel into the combustion chamber. After combustion, the resulting mixture moves through the engine and out of the exhaust valve. Both the intake and the exhaust valves are closed during the combustion process or igniting of the engine. Cylinders and Pistons - The cylinder is the most important part of the engine along with the piston that floats in each cylinder. Most common are the four, six or eight cylinder engines. Pistons are round and move up and down inside each cylinder. Piston Rings - Every vehicle has a piston ring for each piston inside the cylinder. These rings stop air and fuel from leaking into the engine's sump during the combustion process. Connecting Rod - This rod connects the piston to the crankshaft and rotates at both ends during the combustion process. Crankshaft - The crankshaft helps to turn the pistons up and down, similar to a wind-up toy, such as a jack-in-the box handle. Sump - The sump completely covers the crankshaft and contains small amounts of oil to keep things flowing. If you aren't familiar with car engines and how they work, and if you think you are experiencing engine problems, have an experienced mechanic inspect the vehicle and repair it. For do-it-yourself mechanics, there are ways to diagnose car engine problems. Bad Fuel - Many think this is a joke, but your engine can experience a bad fuel mix that clogs intake valves. Check the intake valves on your engine to see if they are open and free of debris. Mixing fuel with non-recommended gas additives can also cause these sort of problems. Rely on the type of fuel, oil, and additives that your owner's manual or technician recommends. Lack of Compression - If air and fuel isn't compressed correctly, the combustion process that starts your engine won't work. Check your piston rings and see if they look worn. Inspect your intake and exhaust valves and make sure they are sealed properly. You may even have a hole in one of your cylinders. No Spark - If your engine won't start or spark, one cause may be a bad spark plug or a bad spark plug wire. Check and replace these as you see corrosion. If a wire to the spark plugs is torn or broken, the spark plug wires need to be replaced. Spark plugs work in a precise way. If they all spark too soon or too late, the internal combustion process won't work, so it's important to keep your spark plugs and wires in excellent shape. Engine Cooling System - The cooling system is made up of many elements including the pressure cap, radiator, cooling lines, fan, and water pump. All of these components should be replaced from time to time to ensure a good running engine and eliminate engine failure. Other Engine Issues - You may simply have a bad battery and need a new one. The bearings that make the crankshaft turn may be worn out. If you run out of engine oil, not only can you burn up the engine, it most likely won't start. If you want to diagnose car engine problem on your own, take a trip to the parts store and buy a generic engine repair manual or visit your local library. The most important thing to keep in mind is not to try and repair your engine by yourself if you don't understand a car's engine. Even if you are successful in diagnosing car engine problems, most engines these days are fine-tuned and are connected to computers that help them work. These computers also help mechanics diagnose problems. 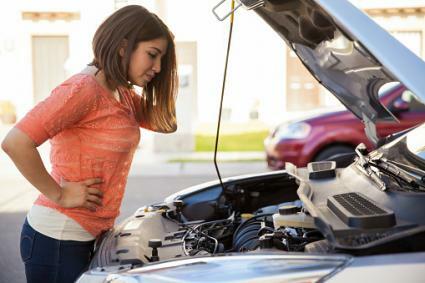 Stay on the safe side if you're unsure and visit your auto repair center if you experience engine problems.